California Girl and I visited Cantina Bulgarini, a vineyard a few miles from Sirmione during our recent trip to Italy. We met with Fausto Bulgarini, the owner, and Rossana who translated between English and Italian. 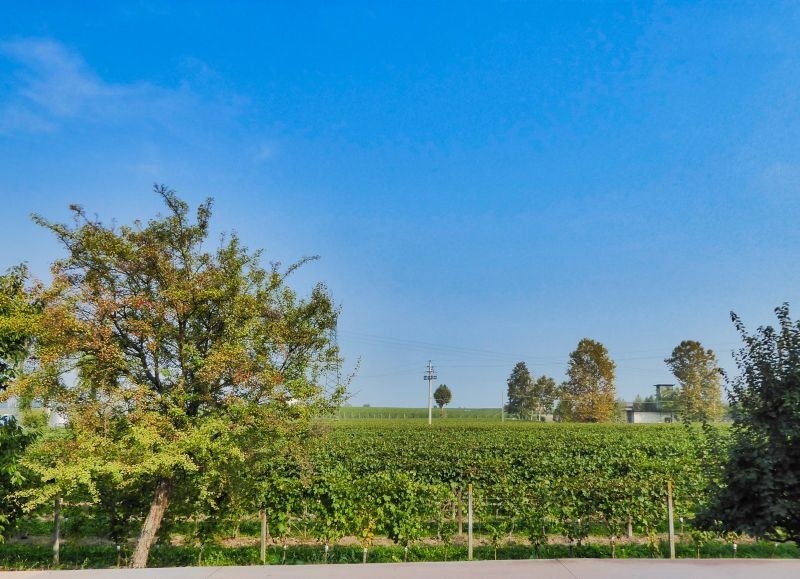 The Bulgarini vineyard traces its roots back to Emilio Bulgarini, the grandfather of the current owner. Emilio had a few rows of vines in the 1930s to make wine for friends and family. His son Bruno planted more vines to create the business now run by his son, Fausto. California Girl Comments: We really enjoyed meeting Fausto. Even though he didn’t speak any English and we had a translator, it was apparent that he was passionate about the wine he makes. The smile and the light in his eyes showed his joy and his enthusiasm. The vines around the tasting room grow in the clay soil of glacial origin, which were once covered by Lake Garda. As Fausto explained, this soil is a challenge to work when wet as it does not drain well. It is difficult to work when dry, as it becomes rock hard. Bulgarini vineyard is in the Lugana DOC (DOC is an Italian region with a recognized style of wine.) There are 1,700 hectares (4,200 acres) of vines with 120 different producers in the Lugana DOC. Bulgarini has 50 hectares (123 acres) and produces 800,000 bottles a year, of which 70% is white wine. 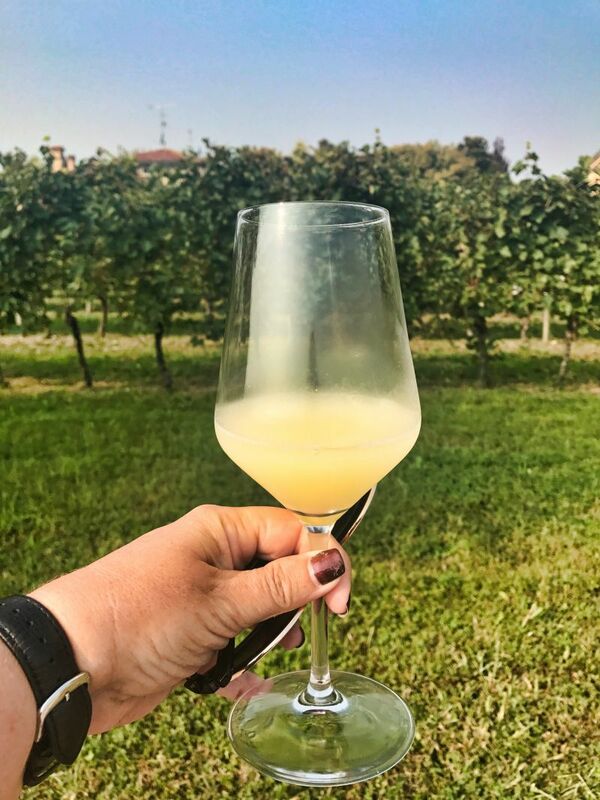 I found it interesting that in the US, wineries talk in terms of cases produced, but both the Lugana vineyards we visited gave production numbers in bottles. When we visited, in the second week of October, they had just completed their harvest after six weeks of work, which started at the beginning of August with picking Chardonnay. It has been a challenging year, with frosts in March stopping the ripening. 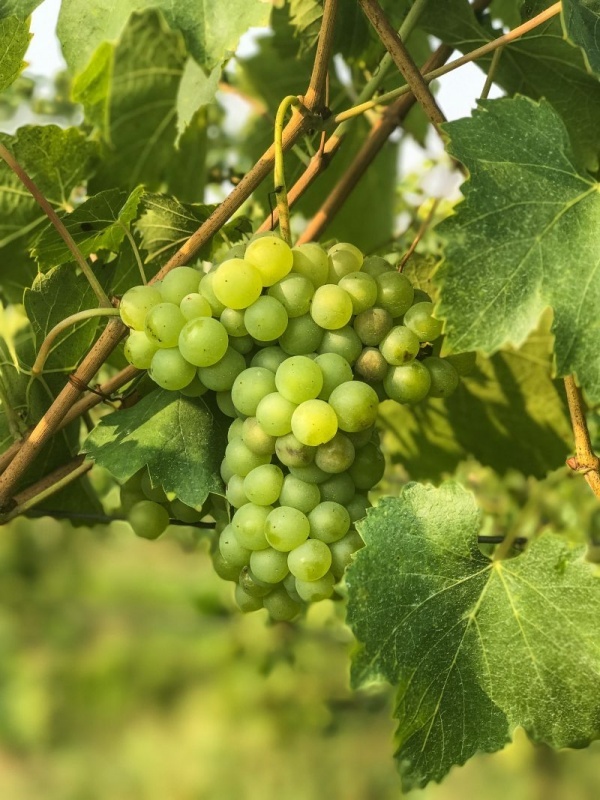 The yields are lower than they were in 2016, but they are hoping for a great vintage. All of the grapes are hand-picked. Twenty-five temporary workers are used during harvest; a mix of students and retirees. We walked into the vineyard surrounding the tasting room and production facility. The first lot was what Fausto called baby vines, Turbiana grapes planted last year. We tasted the fruit, small, and sweet, but it will be another three or four years before the grapes will be ready for making wine. The leaves on these vines were plentiful; there to protect the young vines from the weather. 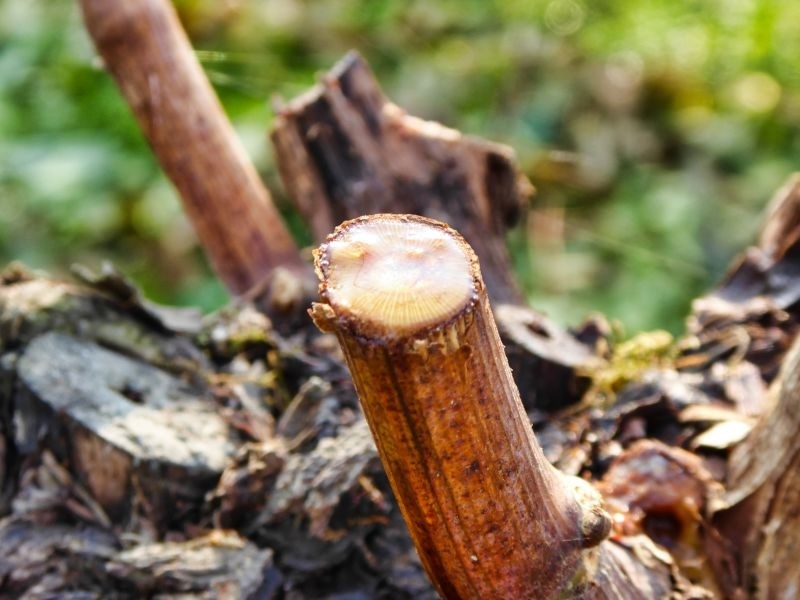 The older vines had already had the leaf cover cut back; these babies would not have the leaves cut back until after the winter. Fausto then showed us how the vines are trained using what he called the single arch; the shoot was pulled up and over the wire in an arch. This is in contrast to the approach we have seen in Napa where the branches are run straight along the wires. At the start of each line of vines grew a rose-bush. Rossana joked that they were there because the winery owner was a romantic at heart. She then explained that roses are very sensitive to disease and act as an early warning sign of danger to the grapes. We were then shown vines that had been pruned a day or two before. A single branch was left to bear fruit next year. The end of the cut stalks was sticky with sap. Fausto said that “he” was bleeding. I had not previously heard vines being described with a gender. Then we were shown some older roots with slim, green, new stalks on them. These had been Merlot vines, but Turbiana vines had been grafted onto the older rootstock. Unlike the fresh planting, these wines would produce fruit for wine in next year’s harvest. California Girl comments: As much as we know about wine, we never cease to be amazed how much more we need to learn. It was fascinating hearing him speak about the process and how he works with the vines. 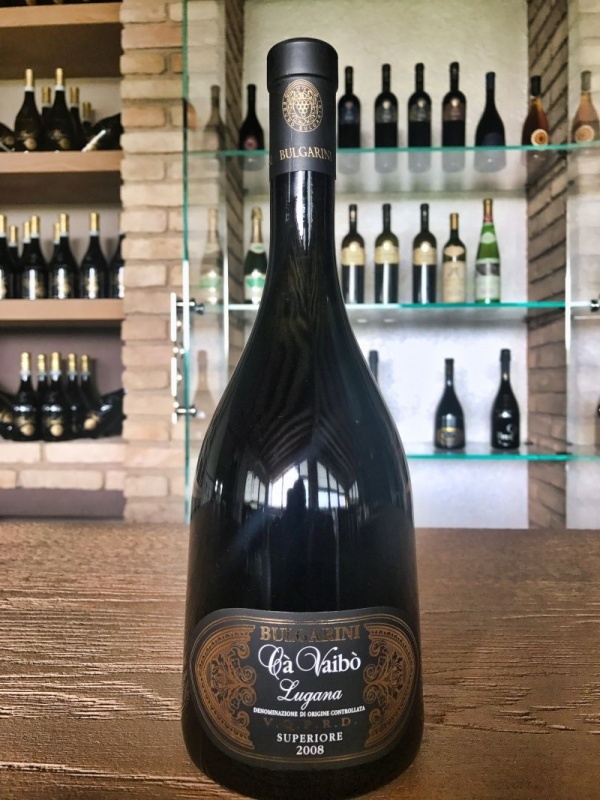 Most of the wine that Bulgarini make are fermented in stainless steel; only a few use wooden barrels, including Rosso Bruno and Lugana Superiore. Bulgarini uses French Oak and American Cherry. Barrels made from the latter wood have more impact; a year in French oak has an equivalent effect on the wine as eight months in the cherry. We tasted a wine direct from one of the massive stainless steel tanks. Fermentation was complete, but it had yet to be filtered. The resulting wine was cloudy, the colour and opacity of grapefruit juice. The nose was heavy with yeast, with floral notes. Tasting it we found high acidity and a slight sparkle. It seems odd that from this unpromising start, a beautiful wine will emerge; the vintner’s equivalent of a caterpillar transforming into a butterfly. California Girl comments: It was wonderful to be able to taste the wine as it is at this stage. Focusing on all of the flavors in the glass, you could get an idea where it was headed as it all melded together. We were then taken into the tasting room, which was behind the wine shop. We each given a plate of cheese and meat. We started with a sparkling wine, the 2014 traditional method Turbiana. The colour was an intense golden hue. It spends twenty months sur lies. The nose was restrained but offered aromas of honey. Taking a sip, we were met with a distinctly Brut style wine with tight bubbles and a crisp acidity. Pear was distinct in a long finish from which yeast flavours were absent. This is a delightfully balanced sparkling wine. The quantities they make mean that they now use mechanical turning, rather than hand riddling. This is the only wine they do not bottle with their onsite bottling line, as the bottles and corks need special equipment. California Girl comments: Being someone who loves sparkling wine of pretty much any type (other than overly sweet ones) I was fascinated by what was in my glass. There was a salinity there, along with the fruit and bubbles and I could imagine a huge plate of oysters, muscles, and crab. It tasted like being next to the sea (or in this case, Lake Garda). Wonderful! Our second wine was the 2016 Lugana. This was described to us as “The Basic” Lugana; I cannot imagine a Napa winemaker using that adjective to describe their wine. The wine is 100% fermented in stainless steel. Far paler than its sparkling cousin, this wine had a medium intensity nose of kiwi fruit and banana peel, with an underlying sweetness. The mouthfeel was creamy with an approachable mix of pineapple and lime flavours and a salty tang on the finish. I would describe it as a summer sipper, California Girl said “porch pounder”, our hosts said it was an aperitif. All three of us saying in our way that this is a wine that does not need food, but can be enjoyed by itself and at €8.90 ($10.50) a bottle, it is an ideal wine for the purpose. The third wine was the 2016 010, another 100% Turbiana. The wine was first made in 2010, hence the name. We were told that the wine sells especially well in Rotterdam, a city whose telephone area code is 010. Thirty percent of the wine spends two months in oak. The grapes come from a thirty-year-old vineyard with lower yields. The nose was floral with mint, melon, and warm tin in the mix; lower intensity than the basic Lugana. The mouthfeel was lively with lime and a distinct slate minerality. Fausto suggested pairing this wine with mushroom and parmesan risotto. It is not as simple as the Basic Lugano and definitely felt as though it needed to be drunk with food. 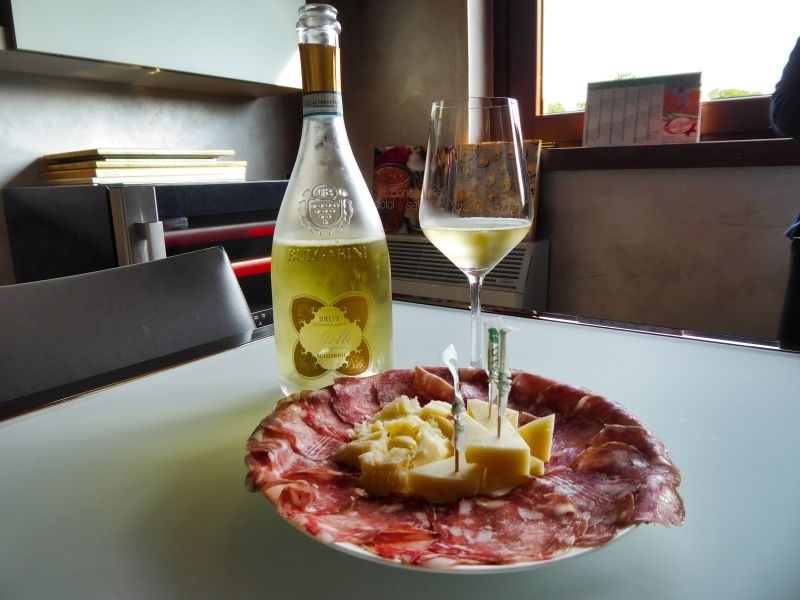 Our last Turbiana wine was the 2015 Cà Vaibò Lugana Superiore. The best clusters are selected for this wine. The grapes are dried for one month. 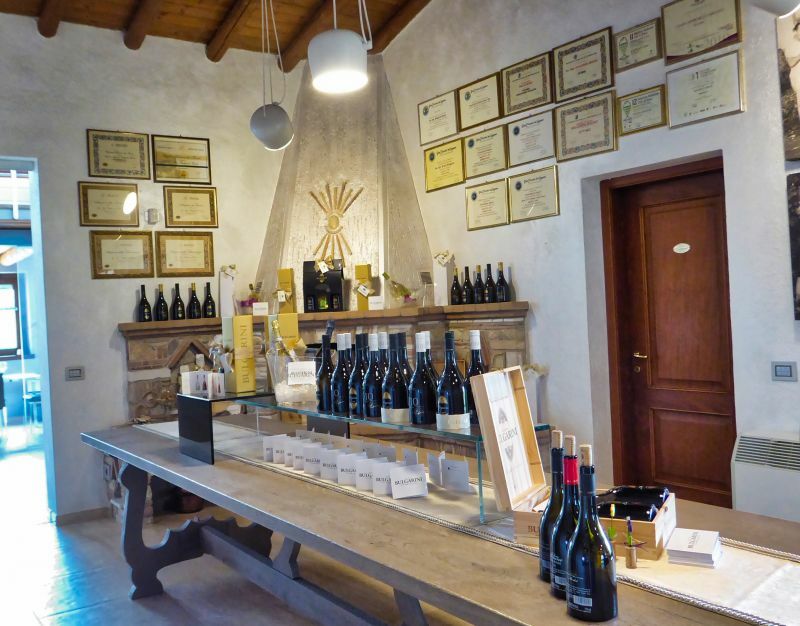 Half of the wine is aged in wooden barrels and spends five to six months in bottle. Just eight thousand bottles were made of this wine. Fausto described it as a meditation wine and suggested pairing with string fish; salmon, lobster, or crab. The wine was more golden in hue. We were met with an intense bouquet of kiwi, apple, and orange blossom. The flavour was equally rich and appealing; guava, passion fruit, and lime-tinged honey. This was an outstanding white wine. California Girl comments: This wine was a WOW! All of the wines we drank were delicious, but this was my favorite. I was trying to figure out how to ship it home as we drank. Just lovely! We finished the tasting with one of the four red wines that Bulgarini make. The 2015 Rosso Bruno is a blend; 50% Corvina, 25% Cabernet Sauvignon, and 25% Merlot. Aged for twelve months in barrels, it offered an intense nose of leather, oak, cassis, and blackberry. The mouthfeel was silky with cherry, raspberry, and blueberry. It felt as though it needed a little more time to smooth out, although low tannins suggest it does not have age potential. The wine gets it name from Fausto’s father. California Girl Comments: Just a little side note and something we found to be a little ironic: Right after our return from Italy, we attended the Wine Bloggers Conference in Santa Rosa, Ca. To our delight, there was a team from the Lugana DOC hosting several events trying to educate our colleagues on the wines from their region. The Brit and I tasted through all of the wines that they brought, but NONE of them was as good as Bulgarini in our opinion. Yes, they were all delicious, but we thought the wines we tasted at Bulgarini were just that little bit more special. 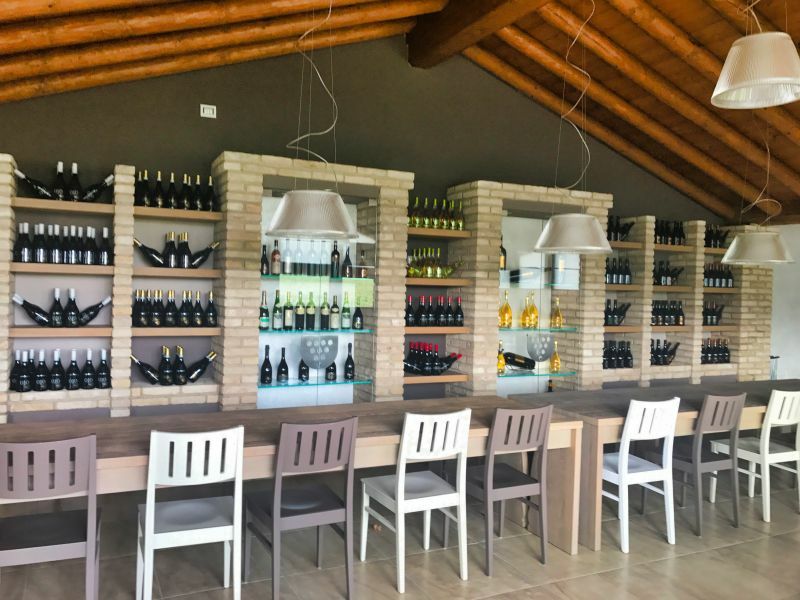 We loved our visit to Bulgarini; the warm welcome, the modern tasting room, and the exceptional quality of the white wine. 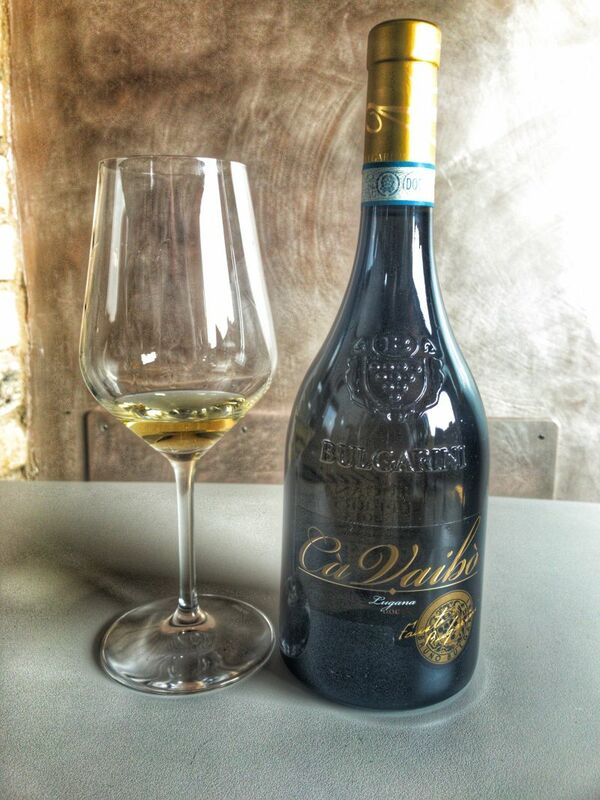 We are planning to have a case of the Cà Vaibò shipped to us, as we could only carry a few bottles back with us. Looks and sounds fantastic, I’ll have to try and see if I can find some near me!